We work hard to make it easy for you to get the most out of your time on the Portage Lakes. We stock a complete selection of effective live bait, and all the right tackle to get you set up right. Make sure you are ready for all that "hot" winter fishing action. Call Ron to make sure you have everything you need for productive cold weather fishing. Enjoy these images of our shop and satasfied customers. 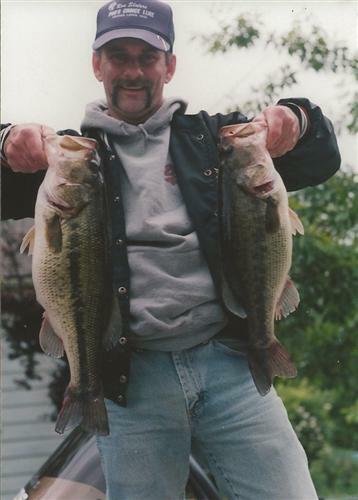 Portage Lakes are known for their peaceful waters, quiet surroundings, plesant residents.... and the FISHING! 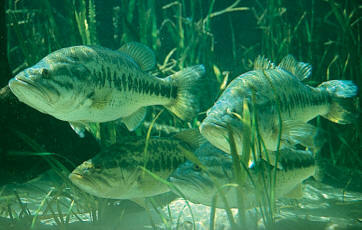 We have some of the biggest, best fighting bass around. Stop out for the daily fishing report, hottest baits, and expert advise. Ron has been fishing these waters a long time and is always willing to help out a fellow fishermen. They're GREEN, and the fish can't get enough! These are LIVE nightcrawlers! Drop by to check them out. We now serve a wide selection of fresh sandwiches, pop, coffee, chips, & pretzels. Stop in to stock up for a great day on the lake, or to just grab a quick lunch before you get back on the water. Call ahead to schedule your own Bass Boat ride or fishing tour. Your captain knows where to fish, and he can take you around the lake on a tournament bass boat. You can always stop in before you hit the water, or drop by to restock while on the lake. We have a 23' dock you can use while you shop! Just pull up and tie off while we get you all set up.